We invite all Girls currently studying in Year 4 to our Try Year 5 day on Tuesday 28 May 2019, for a taste of Year 5 at Santa Sabina College. Now is the perfect time for her to experience life in our Year 5. 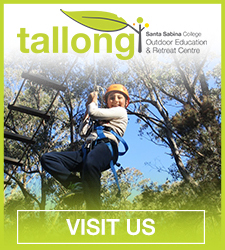 Outdoor Education at Tallong, Santa Sabina College Outdoor Education Campus in the Southern Highlands. Experience a day in the life of a Year 5 Santa girl. The Year 5 class teachers, specialist subject teachers and current Santa students will ensure she has an engaging and enjoyable day.